Home Windows Tutorials MBR vs GPT: Which one is better for your Hard Drive? If you are the person who likes to install Windows on your computer, then you may come across MBR and GPT partitioning. First of all, let’s see what is partitioning. As the name suggests, partitioning means dividing a single hard drive or storage space into virtual divisions so that data can be arranged as per the user’s requirement. Technically partitioning a drive also means how the data is structured and stored on the physical drive. Now you must be wondering what the heck is MBR and GPT? They both are the partitioning schemes for disk storage. There is the separate partition that is generally created at the beginning of the hard disk while installing an operating system. It contains the data about booting process(bootloader details) and some details about logical partitions. And now let’s talk about GPT (GUID Partition Table). It’s the newest standard of partitioning and currently the best replacement of MBR. The structure of GPT is little more extension of MBR. It contains Protective MBR which helps disk-based utilities to prevent misrecognition and overwriting the data on GPT disks. Primary GUID Partition Table Header which contains its own size and location and the size and location of the secondary GPT header. 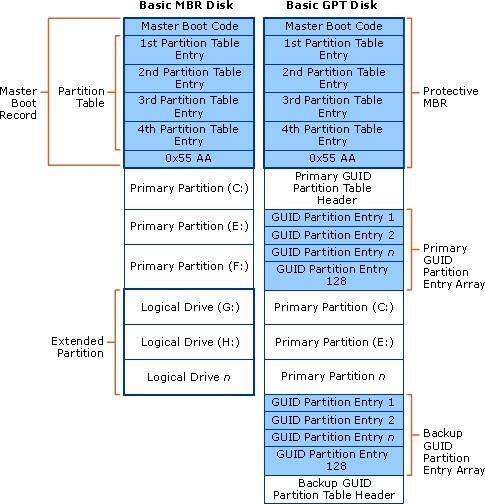 Primary GUID Partition Entry Array. Backup GUID Partition Entry Array. Backup GUID Partition Table Header. Here GUID Partition Table can have up to 128 entries. 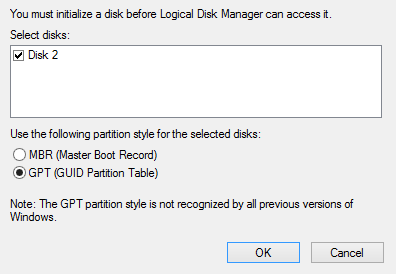 As you can see that there are several advantages of having a GPT partition on your computer, but it really depends on you and your choice of what you use. Let’s say you are using some OS(Most probably an old one) then you must have to go with MBR as GPT will not be supported by that operating system. But if your operating system does support GPT partition scheme then you must go with it as it is newer and will provide better performance and stability. Note: Also note that if you use GPT partition scheme on your hard disk then make sure that you have a UEFI supported computer. Otherwise, your computer probably will not boot up. GPT supports more than four partitions and up to 128 Partitions on Windows. GPT is better for various security reasons. You can connect Hard disk of size more than 2 TB using GPT. GPT can only be used with 64bit of the operating system. So if you are going to install the 32-bit operating system, we will suggest you opt for MBR. Now the question that will be coming to your mind will be how to select which partitioning scheme for a hard drive. There are several third parties tools like Paragon, EaseUS partition manager and several other which can let you set the partitioning scheme. Also if you are running Windows 8 or newer you can go to windows inbuilt partition manager, connect your new HDD or SSD and select the partitioning scheme that you want to use. If you are going to install a new OS on your computer then before you create bootable pen drive you must select which partitioning scheme that you want to install your operating system on. There are several third party software which will let you choose from these option like Rufus, Win32 Disk Imager, etc. If you use any other software to get this job done let us know in the comment section below. You can also migrate your HDD from MBR to GPT using various tools available in the market. However, this is not recommended because depending on the size of the data it will consume a lot of time. Instead of this, you can backup your data, format the HDD using GPT and restore the data. We hope that this article has helped you in clearing out all of your doubts regarding MBR and GPT. If so, let us know your views on it and also tell us which partitioning scheme you find better and more suitable for you. Also, if you have any doubts then feel free to ask us using the comment section below. We would be glad to help you out. Thanks for this nice article that we know about about MBR vs GPT & which one is better for Hard Drive. Most of people don’t know about MBR vs GPT but this is important to know which one is good. Thank You for the correction. We have corrected it!